When it comes to airports, for me, something odd happens. Whilst I have worked in or around them for many years, I often find it very difficult to recall them. If I think back to my backpacking days, the airport was about as interesting as a bus depot. It was somewhere you had to go to get to your destination. Now, I love airports but I for me to remember them, they really need to stand out in a positive way. In this week’s post, I want to consider how airports, retailers and brands try to make the offer memorable. The current trend is to do this using ‘Sense of Place’. Sense of place has been a buzzword for some time now in our channel. It has been the focus of conversations within brands, within retailers and airports operators alike. I want to create a balanced argument and let you decide whether Sense of Place is still valid as a core principle of everything we seem to do in our channel. So for clarity, let’s consider ‘Sense of Place’ in a little more detail. Airports will also try and create locally relevant stores. Having flown through Portland PDX on holiday, it is clear that ‘Made in Oregon’ is a focus. Within Europe, Milan Malpensa is another airport that stands out with stores that reflect the local produce. Finally, although small, Jersey airport has a strong local connection with local produce (The Jersey Apple Brandy Cream Liqueur is amazing!). Whether it is the totem pole in Vancouver, or the ornate carving in Bangkok airport, the ambition is to create an emotional connection with the country or city you are in. These things are to remind people of where they are and create a sense of reassurance in the traveller. I personally think it is more about making a lasting impression and a memory anchor. One of the clever executions I have seen online is the roulette wheel baggage belt. This is a superb piece of work on so many levels. What About Sense Of Place in Travel Retail? Brands have been adapting their in-store product executions to suit. One example is M&M’s where they have adapted their characters to match the location. For example, in the Middle-East, their characters were sat on camels for one display. Toblerone adapted their sleeves to show the location the product was bought to create local relevance. All of these types of executions contribute to the overall sense of place. This leads to the question – ‘Is this just blending in with the surroundings or does it really make products and displays more interesting?’. If you have been on holiday in a location and you see echoes of the location in the airport, does it attract your attention or does it detract? Do you want to see something that makes you stop in your tracks and go ‘Eh?’. The human brain is an incredible machine. It operates 24 hours a day and does a whole host of things in the background to make sure you stay safe. It is also (although it may not feel like it sometimes) incredibly efficient. For example, it learns and then generalises. So, take opening a door for example. The human brain uses a few examples and then makes generalisations on what a door looks like, how to open it and how to get through. This saves valuable energy because it does not need to use valuable processing power to work out how to use a door each and every time you encounter one. I remember watching a program on TV looking at the design of the Eurostar train. The designers went to great lengths to design a way of opening the train door in a simple way to ensure that the passenger did not feel a sense of panic or confusion when trying to get out. At the time, British train doors were predominantly opened using handles. The move to button opening may seem super simple today but if you had never experienced that, it could be seen as a confusing issue. The depths they went to, clearly paid off. For want of a better phrase – we use a little automated program or script in our heads to open the door. If you drive a manual car, you are likely to change gear without even thinking about it, that is an automated program in the brain too. Airports need this level of standardisation in how the operate but would also like to stand out and be remembered. A positive memorable experience is going to make it more likely that you will use that airport again. On the flip side, there is one airport in the world that I will do almost anything to avoid. (I will not name it and my reasons it seems are a common amongst those who travel frequently and have experienced it. That however, is a story for another time). Airports, like bus stops or train stops, they become routine. Routine can make us switch off and go into auto pilot. Shoppers can become ‘blind’ to their environment. Some retailers who operate in airports that have frequent flyers will use 3 week promotional slots to create something that looks a little different each time the passenger goes through. The alternative, I believe is to create a sense of ‘Out of Place‘. So what do I mean by that? Well, if we consider how memory and the brain works, it tries to be as efficient as possible. If you think about the first time you went into your house or place of work, it was probably sensory overload. You scan your surroundings and take in all the details. It may seem new for a while but then it becomes ‘the norm’. Essentially, the brain says ‘ok, got it. It is safe, I don’t need to think about this now’ and it moves on to other things to pay attention to. With airports, even the infrequent flyers will have an expectation of what they will see and experience in the departure lounge. They scan the duty free store and it may peak their curiosity, the may wander round and they may even buy. However, get someone to recall their experience a few months later and the details are vague. The reason, nothing really stands out. One example is Hollister. Ever been to one of those stores? Well, from the outside, they look like a surf shack from outside. Not what you would normally expect from a shopping mall. It draws your attention. Take the Adidas pop up shop that is in the shape of a shoe box. It shocks, it stands out and dare I say it, it is instagrammable. The Jo Malone store in Sloan Street, London. This had what appeared to be a cherry blossom tree growing out of the store and into the street. It is a beautiful execution and captures the attention of people passing by. It certainly would be shared on social media and drive traffic to the store. 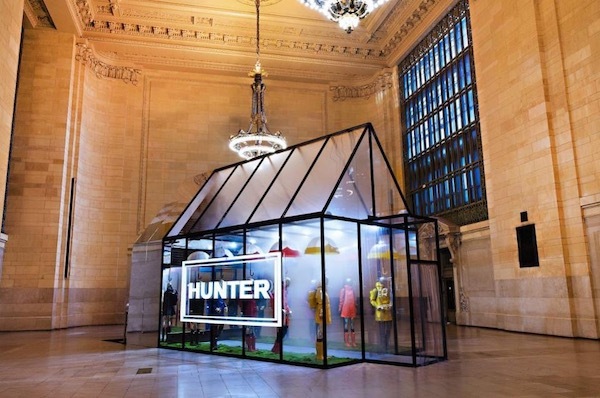 In Grand Central Station in New York, the British Wellington Boot firm created a pop up greenhouse with their products on display. A fantastic, stand out execution that looks out of place in somewhere such as this venue. It draws the attention, creates a sense of curiosity and is instantly photographable. Covent Garden Soup had an interactive display in the form of a giant size version of their product with a slide coming out of it. Even as a grown up, we all love a slide don’t we? In Leeds over Christmas there was a pop up bar called Thors. It was a Scandinavian style hunting teepee with fires inside. It was a great execution and one that stood out in the city. Did it work? Well, at about 6pm the queue at the bar was 5 people deep. Carlsberg have created an interactive billboard – pour your own. No explanation required here! So Is Sense Of Place Right For Travel Retail? OK. I get it. Sense of place is there to create a connection with the locality. Instead of being a soulless environment where people are herded through like cattle, it brings a design to the masses and invokes feelings of connectedness and assurance. There are many reasons why Sense of Place is a good idea. When it comes to the stores and brands though (and even F&B for that matter) there is something to be said for being a little different. Piggy-backing the local themes can have it’s benefits of course…. but… if you REALLY want to stand out, to be memorable, sometimes you need to be ‘out of place‘. Next week, I am going to share what may just be the biggest reason for airports ‘digitalising’ the passenger journey. No…. it isn’t for the passenger’s convenience. Thank you for reading and please feel free to drop me a line and share your thoughts. If you agree, great, if you disagree, that is great too. I always love a discussion. p.s. How are you getting on with the #GTR5CustomerChallenge? (CLICK HERE)Give it a go, it will transform the way you see shoppers in the airport. Image Sources: Hunter – Criteo, Casino Baggage – Trend Hunter, Hollister – Visitfrisco, Adidas – Pinterest, Jo Malone – Your London Florist, Covent Garden Soup – Pinterest, Thor’s – Leeds-List, Carlsberg – Pinterest.